Mentality, once again, doesn’t disappoint. The formula on both of these was flawless. Unfortunately, these are not currently available on mentalitynailpolish.com, but keep your eye out on blog sales. I’d love to know your thoughts, so please leave a comment below! Me too! They are probably one of my top indie brands, I just like them that much. I don’t have any from this brand yet, but I’ve heard good things. I loved that macro shot of Siren! Ohh Im not sure which is my favorite of the two. They both have characteristics that I like. But I think if I had to choose just one Id go with Morality. Something about that shade of purple is calling to me. As always, great photos to show off the polish beautifully. Oh no! 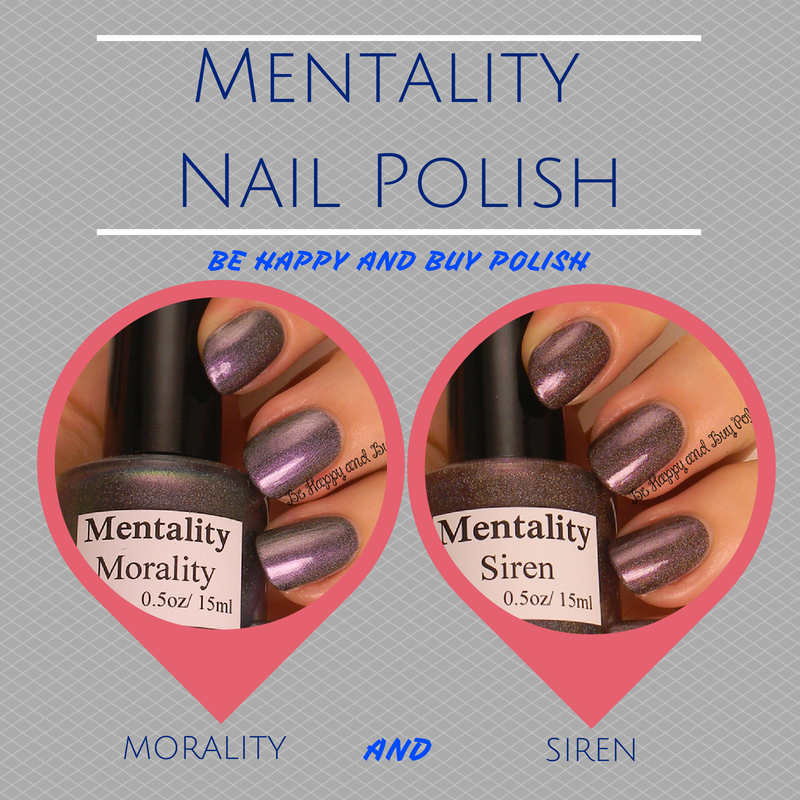 You just HAD to show me some lovely Mentality polishes now did you? My wallet does not like you girl ;-)! ROFL! Sorry Deborah!! I just love Mentality though! Right? Sometimes it’s so hard to make a decision! The flakies in Siren are really interesting! And I also prefer its colour to Morality. From what I understand, their stamping polishes are totally amazing! Plus, who can beat free shipping? Oooh! I hadn’t heard of this brand before. These colors are gorgeous! Jamie, they always have free shipping (US) and they have great colors too! Morality is beautiful! Beats me how you manage to take such stunning shots in your lightbox (and outside). I always end up with pitch-dark shots in my lightbox, even with three lamps around. Maybe because I made the box myself lol. Beautiful! I’ll have to check out their website. Great swatches! These two are very nice deep shades. Both of these are gorgeous! Morality is my favorite of the two but the flakies in Siren are lovely. I just tried Mentality recently for the first time and was really impressed, I might have to go find these haha! Isn’t it lovely? Thanks for commenting Kath! The first Mentality Polish I bought was because you mentioned an amazing sale (which it was), and now I can’t stop thinking about my next purchase. Maybe Siren should be my next one, so gorgeous!